Some of the rising stars among British Columbia wineries have been changing places this summer. One fascinating appointment by Church & States Wines has that winery plucking talent for the second time from Burrowing Owl Estate Winery. In 2005 Church & State proprietor Kim Pullen brought Californian Bill Dyer back to the Okanagan as his consulting winemaker. Bill had been Burrowing Owl’s winemaker from that winery’s launch in 1997 until 2004. Now Jeff Del Nin, the winemaker at Burrowing Owl since the 2006 vintage, becomes Church & State’s new winemaker in September. With Dyer continuing as the consultant, Pullen has assembled one of the strongest winemaking teams in British Columbia. This season’s winemaker musical chairs was started in May when Kenji Hodgson left JoieFarm to take a winemaking sabbatical in France. JoieFarm recruited Robert Thielicke whom had been part of Mt. Boucherie’s winemaking team with former banker Dave Fredericks. In 2008 Robert, who had been an assistant winemaker at Mt. Boucherie for five years, took over the senior winemaker slot when Graham Pierce took the winemaker/general manager post at Black Hills. Dave Fredericks’s new partner at Mt. Boucherie is Jim Faulkner, who moved there in July from Church & State’s winery in the Saanich Peninsula. Now, Jeff Del Nin is taking over Faulkner’s job, but not in the Saanich winery. Church & State is moving most of its wine production to a leased building south of Oliver, near to Church & State’s vineyards. Fortunately for Burrowing Owl, Jeff has recently hired an assistant winemaker for that cellar, Scott Stefishen. A Canadian with training and experience in Australia’s Margaret River, he worked earlier this year as an assistant winemaker at Road 13 Vineyards. Burrowing Owl is a hallowed wine brand in British Columbia but Church & State is coming on strongly. Earlier this week, Church & State accepted a Lieutenant Governor’s award for excellence for its 2006 Coyote Bowl Vineyard Syrah. This is the latest in a growing list of awards, including a double gold at the All-Canadian Wine Competition for Quintessential, the winery’s flagship red blend. Church & State currently produces about 12,000 cases a year, roughly a third of Burrowing Owl’s production. However, the winery owns or controls about 120 acres of vineyards, not all in full production yet. “He’s a keen guy,” Kim says of his new winemaker. One of the details that appealed to Kim, a tax lawyer with a strong scientific bent, is Jeff’s background in chemistry. Born in Thunder Bay in 1971, Jeff has a bachelor’s degree in chemistry from Lakehead University and a master’s in chemistry from Queens, where he specialized in plastics and polymer research. At one job, he spent two years developing synthetic closures for wine bottles. Here, he observed winemakers from close at hand and the penny dropped: “I started to think maybe I could do this for a living.” After dipping his toe in a course for amateur winemakers, he enrolled in the wine school at the University of Adelaide and did hands-on winemaking at Barossa Valley Wine Estate. On graduation, Jeff decided to get experience in wine regions elsewhere. He got a job in 2006 with a Long Island winery in New York state but realized after a month that it was ill-suited for making the Australian style-wines that he had come to like. As it happened, he had done his first-ever Okanagan winery tour on the way to Long Island and had been particularly impressed with Burrowing Owl. So he telephoned the Okanagan winery. By lucky coincidence, Burrowing Owl was looking for someone with his experience to help with the huge 2006 vintage. Jeff should be able to apply some of his Australian artistry to Church & State in the current vintage. A potentially devastating blow has been dealt to British Columbia wineries by the Alberta Gaming and Liquor Commission (AGLC), the importer of wine into that province. It appears that nearly every winery in British Columbia received a chilling letter, dated July 15, from Gerry McLennan, the chief executive of the AGLC. A similar letter was sent to courier companies. We have recently received a number of complaints regarding one or more British Columbia manufacturers who have been shipping liquor (wine) to Alberta directly to customers in contravention of the federal Importation of Intoxicating Liquors Act and the Gaming and Liquor Act and Regulation (Alberta). All liquor imported into Alberta must be consigned and shipped to the Alberta Gaming and Liquor Commission. Deliveries of liquor from outside of Alberta directly to any other address are in contravention of the federal Importation of Intoxicating Liquors Act and could result in criminal prosecution. This is the sequel to what happened a year ago when both the Liquor Control Board of Ontario and the Manitoba Liquor Commission sent similar letters to a number of British Columbia wineries, warning them not to continue shipping directly to consumers outside this province. British Columbia liquor regulators supported those moves. The effect of those moves was to curtail the growing, and significant, volume of sales outside the province through winery web sites. The AGLC letter delivers the coup de grace to internet selling beyond British Columbia borders. It is a puzzle who would complain: possibly, private wine stores in Alberta who might see direct shipping as competition. More likely, the complainers are other liquor boards. This is also a blow to wine tourism. Easily a third of the visitors to Okanagan wineries come from Alberta. When they find wines they like, they fill up their vehicles with cases of wine before heading home. Having established relationships with various wineries, they are likely to re-order and then to re-visit. Technically, it is illegal for private individuals to transport liquor across provincial borders as well. That is rarely enforced but nothing stops the AGLC from asking the police to mount sporadic road blocks. Liquor boards have done that. In fact, this action likely will prove a disincentive to Albertans buying wineries in British Columbia. And there are a number of producers here currently trying to sell. After the issue of cross-border shipments arose last summer, the Canadian Vintners Association, along with the British Columbia Wine Institute and the Wine Council of Ontario tried to craft a resolution that would preserve internet business. They made a proposal to the Canadian Association of Liquor Jurisdictions (in effect, the provincial liquor boards). They suggested adopting the policy now in place in the Yukon where consumers fill out the necessary paperwork at a local liquor store, remit the Yukon tax and then have the wine shipped. The CALJ rejected the proposal, sending the wine industry back to the drawing board. Clearly, the provincial liquor boards all are jealously guarding the stream of taxes they get from wineries. The CALJ’s tepid counter proposal was that liquor boards would seek to streamline the constipated way in which they now handle orders from private citizens. This is all about tax collection. Direct shipments, for example, to Alberta consumers mean that the AGLC does not collect its minimal mark-up on those wines. Alberta, as we all know, needs more money. The galling irony of the Alberta action is that it seems to fly in the face of the Trade, Investment and Labour Mobility Agreement, a “freer trade” deal that was concluded in 2006 between Alberta and British Columbia. Unfortunately, the negotiators excluded liquor from its terms. For discussion from a lawyer's perspective, I refer you to this excellent web site: www.winelaw.ca. Meyer Family Vineyards, which has just released its two Chardonnays from the 2007 vintage, has begun to establish a track record for producing elegant and sophisticated examples of this varietal. The winery, which began direct sales last year, is the brainchild of John "JAK" Meyer, an Okanagan developer turned wine lover. He is pictured above with his sisters, Laura and Terry, and (on his left) Chris Carson, his New Zealand-trained winemaker. Chris joined Meyer before the 2008 vintage. The 2007 Chardonnays, reviewed here, were made by Road 13 winemaker Michael Bartier. 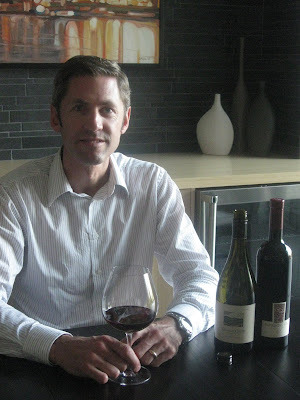 Chris has worked with wineries in New Zealand, France and California that specialize in Chardonnay and Pinot Noir. In the 2008 vintage, Chris made both varieties for Meyer and, as a recent barrel-tasting showed me, did both very well. Both of the 2007 Chardonnays are from the same 3.1 acre vineyard on the Naramata Bench that JAK bought in 2006 after a two-year search for just the right property. It is his intention to have a showpiece boutique winery built here eventually. That idea was shelved temporarily late last year when JAK bought a second vineyard (14 acres) just east of Okanagan Falls. Meyer is preparing to open a tasting room here this fall. The Okanagan Falls vineyard, which has several more plantable acres,grows a mix of varieties. It is likely to be restructured, at least in part, to focus on Chardonnay and Pinot Noir. Chardonnay is JAK's passion and Pinot Noir is his winemaker's passion. JAK decided to create a winery in 2003. Recognizing that his only experience was as a consumer, he sought the guidance of Vancouver wine educator James Cluer MW. A fundamental decision was to base the winery on a vineyard that JAK would own, not on purchased fruit. The Naramata vineyard's Chardonnay vines are now more than 10 years old. There also are mature vines in the Okanagan Falls vineyard. With two vineyards and a skilled winemaker, JAK's original dream of a tiny boutique is now being reshaped into a 3,000 to 5,000 case producer. "We may not make any money at this," he laughs, "but it sure is fun." In each of the 2006 and 2007 vintages, the winery has produced two Chardonnay wines. The wines in the Tribute Series pay tribute to various British Columbia artists. The 2006 vintage was dedicated to Emily Carr. This vintage is dedicated to Bill Reid "for his extraordinary contribution in restoring much of the dynamic power, magic and possibility to Haida art." The winery is donating $5,000 to the Bill Reid Foundation. Until the wine shop opens, the wines are being sold (in cases of six) through the web site, www.mfvwines.com. The Cassini Cellars winery, which had its grand opening earlier this summer, is a good example of how the wine industry is changing the Okanagan landscape. A couple of years ago, this was the site of one of British Columbia's several lavender farms. In late 2006 Adrian Capeneata (above)bought the highway-side property, sold most of the lavender plants and replaced them with vines. While the vines were getting settled in, Adrian supervised the construction of his grandly conceived winery. The wine shop is especially grand: the primary tasting bar is 10 metres long, enough to host 25 visitors at once. There is a smaller bar at the other end of the room if there is an overflow, as is certain to happen from time to time. This high-profile winery, with its convenient parking lot, is irresistible to bus tours. 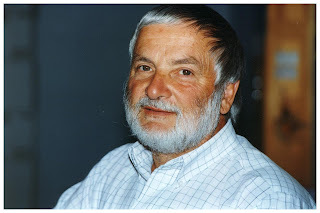 Born in Romania in 1960, Adrian is one of those larger than life individuals that winery visitors find engaging.After managing a restaurent in his native land, Adrian came to Canada in 1990, shortly after the collapse of the Communist government in Romania. He started his career here in Montreal, learning French and English, working in restaurants and repairing and re-selling used cars. He admits to being a serial entrepreneur. Coming to Vancouver in 1993, he began selling fitness club equipment and then set up his own company to build and service such equipment. His interest in the Okanagan began with a vacation there. Soon, he was fixing up and reselling houses in Osoyoos (his wife is a realtor). His interest in wine has two roots. His family in Romania had a vineyard, selling grapes to a cooperative. However, his appreciation for wine developed in the years when he worked in restaurants. In 2006, he decided to develop a winery of his own, buying the lavender farm because of the strategic location and the property's potential as a vineyard. Having also had a construction business, Adrian took more than a supervisory role in building the winery. By his estimate, he has invested $400,000 of his own "sweat equity" in the construction. Originally, he wanted to called it Crazy Horse Winery. The potential for confusion with Inniskillin's Dark Horse Vineyard resulted in the current name, Cassini Cellars. Cassini is the surname of Adrian's Italian grandfather. Winemaking here is done by consulting winemaker Philip Soo (whose other clients include Noble Ridge and Dirty Laundry). Working with purchased grapes in the 2007 and 2008 vintages, he crafted a solid range for Cassini's debut season. Here are notes on the wines. The white wines are $18 a bottle while the reds are priced in the mid-20s. The most northerly of the Gulf Islands with vineyards, Quadra Island, once again has a winery: SouthEnd Farm Vineyards opened this month. Owners Jill Ogasawara and Ben McGuffie take pride is being the youngest couple currently with a winery in British Columbia. He was born in 1977, she in 1976. On the winery website, they joke that they are starting their retirement project 30 years early. In a business filled with second careerists, it is rare to find two young people launching a winery. In the entire history of British Columbia wineries, only Walter and Gordon Gehringer were younger (barely) when they opened Gehringer Brothers in 1986. SouthEnd Farm is the only winery on Quadra (the large island just off the coast from Campbell River) but not the first. Marshwood Estate Winery opened on Quadra in 2004 and closed two years later when the owners sold the business. The Marshwood vineyard, now called Nevermore Farm, still produces grapes, some of which have ended up in SouthEnd wines. Ben McGuffie grew up on Quadra. His great uncle managed the island’s roads and is believed to have homesteaded the 12.5-acre farm that is now home to the winery and a small vineyard. Ben is an engineering graduate from the University of British Columbia. In recent years, he has been an engineer and manager at Catalyst’s pulp mill in Campbell River (a 10-minute ferry ride from Quadra). Jill grew up in a logging community near Campbell River and met Ben in high school. She has a forestry degree and has qualified (but not practised) in landscape architecture. They became interested in wine over a bottle of domestic plonk called Rotting Grape. Soon they were visiting Okanagan wineries and dreaming of their own. After buying the family farm from his parents in 2004, Ben and Jill began developing a vineyard, planting four acres of primarily Maréchal Foch, Petit Millot and Siegerrebe, with a little Leon Millot and Bacchus. Next year, they intend to add some Cabernet Foch (one of the disease resistant Swiss-developed red varieties already grown by several Vancouver Island producers). They have also provided a market for the grapes from Nevermore and from another vineyard on Quadra. SouthEnd Farm (guess which end of Quadra the winery is?) intends to be an estate producer only, with no imported grapes from the Okanagan. Two of the debut wines – a white and a rosé - were sent to me from Quadra. I can report it is an impressive start. The winery has also released an off-dry Ortega and an off-dry Siegerrebe. SouthEnd Farm Bara 2008 ($18.40). Bara is the Japanese word for rosé, so I am told. The wine, made with Pinot Noir, has a lovely rose petal hue, with aromas and flavours of strawberries and cranberries. Again, it is well-balanced with just enough residual sugar to offset the acidity. This is a delicious, juicy summertime rosé, made all the more accessible because the alcohol is only 10%. 88 points. The winery has also released a red wine, Turan 2008 (another name for the Agria grape) and Sutil 2008, a dessert wine made from Agria. SouthEnd opened with about 6,000 bottles of wine. The website promises two other wines but there are no details so far. These are excellent wines from a very difficult vintage. The 2009 vintage on Quadra Island, Jill reports, is shaping up to be far better, with riper grapes. Nevermore Farm tented its Pinot Noir this spring. Ben and Jill are planning to make a red wine this fall from these grapes, assuming the season continues to be warm and dry and ideal for the vines. The agency is being run independently by Jim Williams, a sales executive with 15 years of solid experience with both Vincor International and Mark Anthony Brands. He spent the 18 months to June 1 away from the wine industry, managing the western Canadian division for Johnson & Johnson, the health care products company. Now, Jim is back to build a boutique wine agency, representing not just the two Okanagan wineries but eventually a portfolio of premium import wines as well. There is a lot of corporate history behind this development. In 1996, an investment by CedarCreek Estate Winery launched another boutique Vancouver agency, Medallion Wine Marketing Inc. Subsequently, Quails’ Gate and Hardys Wines of Australia also became partners in Medallion. Hardys was taken over in 2003 by Constellation Brands, the New York-based giant wine company that acquired Vincor in 2006. Two years later Constellation decided to streamline its Canadian wine marketing business by buying Medallion and folding it into the Vincor Canada sales organization. That is how Vincor in April 2008 became the agency for CedarCreek and Quails’ Gate. Industry peers knew it was only a matter of time before those two wineries extracted themselves from an awkward situation where their biggest competitor, Vincor, was also selling their wines. In March this year, CedarCreek named Free House Wines + Spirits Ltd. of Vancouver as its new agency. Quails’ Gate, meanwhile, went back to the original strategy of investing in a new agency, teaming up with Burrowing Owl to create Appellation. Burrowing Owl has also moved itself from the shadow of a major competitor. Ever since the winery was launched in 1997, Burrowing Owl’s agency has been Grady Wine Marketing. That representation stayed in place after Grady was acquired by Calona Wines, and then after Calona was acquired in 2005 by Andrew Peller Ltd.
Peller is the largest Canadian-owned wine producer, the third largest vineyard owner in the Okanagan and an emerging competitor in the premium wine market to Burrowing Owl. For example, there is a long range plan to build a winery next door to Burrowing Owl for Peller’s top premium brand, Sandhill Wines. Burrowing Owl decided to move to Appellation as part of a strategy to keep its profile high in an increasingly competitive market. In Jim Williams, Burrowing Owl and Quails’ Gate have found a marketer with extensive big winery experience. He started his career with Vincor just as that company was inaugurating its Jackson-Triggs brand. He helped launch one of the most successful of Canadian wine brands. 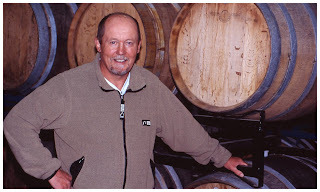 When Vincor bought the Sumac Ridge and Hawthorne Mountain wineries in 2000, Jim became the national marketer of those brands in close collaboration with Sumac Ridge founder Harry McWatters. “It gave me that exposure to a family business,” he recalls. When those brands were moved over to Vincor’s growing sales team, Jim joined Mark Anthony Brands as national wine director. This gave him experience in dealing with import wineries. Jim also spent three years as Mark Anthony’s sales director in Western Canada, looking after a vast portfolio of brands that included Mike’s Hard Lemonade and Corona beer from Mexico. When Corona dropped Mark Anthony in 2007, Jim downsized the sales team – including himself. He says that his stint with Johnson and Johnson gave him insights into that company’s successful methods of developing its staff. Some of those methods, he says, will be useful in recruiting and training his team at Appellation. Chris and Beata Tolley, the owners of Twisted Tree Vineyards & Winery in Osoyoos, have a strategy to make them stand out among the growing profusion of Okanagan wineries: make wines with varieties that are rare in the valley. For example, they currently have two vintages of Tannat and one vintage of Corvina aging in their barrel cellar. To the best of my knowledge, they are the first to grow these varieties in the Okanagan. Tannat is a red variety that produces big, firm wines in Uruguay and in the south of France. The variety’s reputation to be overly tannic likely explains why it is not often found elsewhere. Twisted Tree has not yet released a wine, in part because Chris is still learning how to deal with the variety. In the Okanagan, high tannin seems not to be the issue. He has found that the variety, grown on his sandy site, comes in with normal tannins. However, the variety has an unusual sugar composition which caused fermentation to stick in two barrels in 2007, the first vintage. Chris learned what the problem was after having a sample analyzed in a California wine laboratory. He then took the necessary action to get fermentation complete in those two barrels. That wine has a different flavour profile than the other barrels. Chris has talked an Okanagan laboratory into acquiring the technology for analyzing the sugars in Tannat. The ferment in 2008, as a result, was normal. Both vintages, tasted from barrel, are quite interesting. The 2007 is a muscular and pleasantly rustic wine while the 2008 has a more elegant structure and attractive cherry flavours. Undoubtedly, the variety will yield good wine in the Okanagan. But until Chris dials in the style of Tannat that he wants, he is likely to blend these two vintages and release them under Twisted Tree’s other label, Second Crossing. Corvina is the Italian red grown to make Amarone. Twisted Tree has only 500 vines. So far, Chris has just the 2008 vintage in barrel. In the classic fashion, the grapes were air-dried in the winery, reducing the cluster weight by a third, before fermentation began. That technique concentrates sugars and flavours. The barrel sample of the unfinished reveals a rich, plummy red with some residual sweetness. This will be an exciting red when released. Chris says that Twisted Tree has “a few other experiments” in its vineyards as well. Twisted Tree produces mainstream varietals, such as Merlot, from purchased grapes, reserving its own vineyards for cutting edge varietals, often Rhone varietals. He also has a small plot of Carmenère, one of the few in the Okanagan with this late-ripening red. He is unlikely to expand his plot. Because the variety is late, it must be cropped at uneconomic yields in cool years. “I don’t think I would want to have 10 acres,” Chris says, even though the barrel sample of his 2008 is quite tasty. The current releases show both strategies – wine from exclusive estate varieties and wine from purchased fruit. Six years after opening in 2003, the Pentâge Winery in Penticton has yet to open an onsite wine shop and tasting room. However, that does not mean the wines are hard to find. The winery’s website lists an astonishing number of British Columbia restaurants and private wine stores in which one can get a Pentâge wine (aside from ordering it directly from the winery). Proprietors Paul Gardner and Julie Rennie have had other priorities. One was nurturing the new vineyard (not far from the winery’s original vineyard). Those vines will yield their first fruit this fall, enabling Pentâge to extend its already interesting portfolio of wines. Coming in a year or two is Zinfandel, Mourvedre, Malbec, Petite Sirah and Petit Verdot. Paul’s other priority has been completing the new wine cellar. He has dug an immense cavity into the hard rock on the highest point on the Pentâge property. Think of a small airplane hangar which now houses tanks, barrels and cases of wine at a temperature that is cool the year round. Some time next year, a huge door with glass panels will be fitted on the side where the cavity emerges from the rock. This will afford views across the vineyard and toward Penticton’s Skaha Lake beaches to the north. And in good time, a tasting room will rise from the roof of this magnificent cellar, offering some of the best winery views in the Okanagan. Of course, visitors want to come here for the delicious wines made by Paul and Adam Pierce, the winemaker who joined Pentâge last year when Dwight Sick moved to Stag’s Hollow. The current releases reflect the work of both of these fine young winemakers, along with Paul’s effective work in the vineyard. These are notes on current releases, except for the Icewine, which will be reviewed later. Pentâge Gewürztraminer 2008 ($18). Fermented entirely in stainless steel, this is a textbook example of this popular aromatic variety. The wine invites you with aromas of spice, lychee and peaches, leading to all of those flavours on the palate. Packed with fruit, it has a rich finish. The fruitiness creates an impression of sweetness but the wine has a crisp, dry finish. 90 points. Pentâge Riesling 2007 ($19). Here is another solid serious dry Riesling. It begins with aromas of lime and a bready note, suggesting it was aged a bit on the lees to add texture. On the palate, there are flavours of lime. The wine has a backbone of minerality, an important character of good Riesling. The lively, but well-balanced acidity, gives the wine a crisp and refreshing finish. 89-90. It was a silver medal winner in last year’s Canadian Wine Awards. Pentâge Viognier 2007 ($23). The winery is moving from corks to screw cap closures. It is too bad the move did not begin with this vintage, for my sample suffered a cork taint – slight enough, fortunately, that one could taste through it to the flavours of melons and apricots. The aromas had been killed by the cork taint. I am confident that a sound bottle would easily score 90. Pentâge Cabernet Franc 2006 ($28). Another silver medal winner at last year’s Canadian Wine Awards, this is a generous wine, tasting of blackberries, cherries, and spiced currants. The long ripe tannins give this wine a firm, chewy texture. It is drinking well now but has the structure to develop even more complexity over the next four or five years. 88-90. These wines should create a sense of anticipation among Pentâge fans for the additional wines that the new vineyard will add. Tasting room at Salt Spring Vineyards (above). Vineyard and winery at Garry Oaks Winery on Salt Spring Island (below). At the recent Victoria Festival of Food and Wine, I had the privilege of moderating a panel dedicated to wines that were called Champions of the Islands. The point was to focus on some of the best wines produced exclusively from island-grown grapes. A number of the wineries on Vancouver Island and the Gulf Islands make only estate-grown wines deliberately. That is the policy of Venturi-Schulze Vineyards, which is run by Giordano Venturi, Marilyn Schulze and her daughter, Michelle (pictured above). They understand why some of their peers also offer wines made from Okanagan grapes. There are varieties, such as Syrah and Merlot, that simply do not ripen on the wine islands but are popular with consumers. Some very fine wines are made with Okanagan fruit. Church & State Wines in Saanich has just won a Lieutenant Governor's Award of Excellence with its Okanagan Syrah. However, the seminar I moderated concerned itself with outstanding wines made in the challenging terroir of the wine islands. While the current season is likely to produce superbly ripe island wines, the last two years were cool and wet. It took very fine grape growing and imaginative winemaking to produce an island champion. At Venturi-Schulze, Giordano, the winemaker, turned a potential disaster of inadequately ripe grapes in 2007 into a triumph - a wine called The Bad Boys ($26.10). It is a blend of Zweigelt and Pinot Noir, both red varieties, but this is a white wine. The grapes, lacking the colour that year for red wine, were pressed and the juice was fermented in new French oak barrels. The technique tamed the acidity, captured fruity flavours, in a wine with a rich texture and a light bronze blush. Those at the seminar also sampled the winery's Brandenburg #3 2007 ($36.50 for a half bottle), a dessert wine made in a highly original manner. Giordano concentrates the flavours and aromas of Madeleine Sylvaner juice by simmering it.The initial purpose is to make balsamic vinegar. However, a portion is fermented as a wine. Relatively low in alcohol, this wine is like drinking a very elegant ribena juice, but better. The most reliable red variety on the wine islands is, arguably, Marechal Foch. The grape ripens reliably even in cool years, yielding dark and full-bodied reds that, because the tannins are soft, are early-drinking wines. Two of the leading producers are Starling Lane Winery and Alderlea Vineyards. Starling Lane is owned by three couples, some of whom are pictured above. The winemaking partner is John Wrinch (stripped shirt), a radiologist in Victoria and one of four (!) doctors involved with island wineries (not counting Bryan Murray of Victoria Spirits). Starling Lane has produced several vintages of Marechal Foch that is generous on the palate, including the 2007 vintage that was tasted at the seminar. It sells for $23 at the winery, when and if it is available. Even less was made in the 2008 vintage because the Foch grapes left hanging in the Wrinch vineyard into a rainy November were attacked by mildew. In a warmer season, the grapes would have ripened earlier, before mildew had a chance. Alderlea is operated by Roger Dosman (below) and his wife, Nancy. Roger has always released his Marechal Foch under the proprietary name, Clarinet, because, as he once remarked, "it is too good to be called Foch." Aged in oak, like the Starling Lane wine, Clarinet also has th generous texture and plummy flavours to distinguish this variety when made well. Blue Grouse Vineyards owner Hans Kiltz (above) is a former veterinarian. 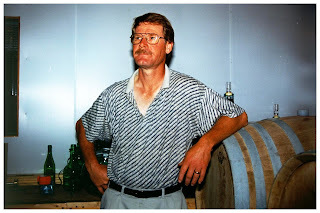 (He was the first medical person to enter the island wine business when he opened Blue Grouse in 1993.) Unlike some of his peers, he will not place little tents over the vines for a few weeks in spring to kick-start the growth. He just works with what nature gives him. Nature was not kind to island grape growers in 2007. Even so, the Blue Grouse 2007 Pinot Gris ($23) was applauded as a triumph by fellow winemakers at the seminar. It is a delicious wine, full of fruit flavours and with a crisp, refreshing finish, reflecting superior viticulture as well as fine winemaking. Andy Johnston, a retired doctor, opened Averill Creek Estate Winery in 2006 with the ambition to make, among other varietals, outstanding Pinot Noir. This is a variety made well by all producers on this panel. They all believe that the islands have the soils and climate to grow Pinot Noir with good colour (perhaps better than the Okanagan) and with attractive feminine flavours. The Averill Creek 2006 Pinot Noir ($32) is a wine with beautiful elegance. At Garry Oaks, owners Marcel Mercier and Elaine Kozak grow (among other varieties) an Austrian red called Zweigelt. This variety is showing a similar ability to Pinot Noir at ripening on the islands. Because the variety is unfamiliar to most consumers, the winery releases it under a proprietary name. Zeta 2006 ($25) is a full-bodied red with spiced cherry flavours. Their next door neighbour is Salt Spring Vineyards, now owned by Joanne and Devlin McIntyre, both doctors, who took over the winery last year. The portfolio included a sparkling wine called Karma, now renamed Morning Star. The name change is part of the added attention that the new owners, who love Champagne, are giving to the production of this fine, dry, bottled-fermented wine. Anyone with a swimming pool or a picnic at the beach knows that glassware is a bad idea. Break your wine glass and you might cut someone else's foot. One solution is the Govino wine glass (above), made of shatterproof pharmaceutical grade plastic. Govino, which retail around $5 each, are made in Taiwan and are distributed in Canada by B & M Marketing (Canada) Ltd., the Toronto firm (905-855-8208) that introduced in 2007 the marvellous breathable wine glass made by Germany's Eisch Glasskultur. Those exceptional glasses, now widely available in stores selling stemware, soften the tannic edge of young red wines. The function of Govino is simpler. It is a well-designed unbreakable glass designed for the beach or the picnic. It is the first plastic wine glass that I have used which seems as neutral as one made with real glass. It does not alter the aroma or flavour of the wines, unlike the cheap disposable party plastic. This is a reusable vessel that will serve you for years, as long as you do not wash it in the home dishwasher, where sometimes excessive temperatures may alter its shape slightly. Anyone serving a young red wine knows that the wines are better after being decanted; the exposure of the wine to air softens the textures and opens the aromas and flavours. That's what the Eisch stemware does for a wine. Not everyone has Eisch stemware or a decanter or wants to be bothered with decanting. Recently, I have tasted wines that had been served after being poured through alternatives to the decanter. They all do the job very well. Pictured above is an attractive Italian-made product called Centellino areadivino. It effectively decants wine a pour at a time. Simply tipping the bottle to fill the amphora provides the aeration that opens the aromas and flavours of the wine. Centellino is distributed in British Columbia by GeaWineWorks and the contact is Angelene Janusonis (604-531-7506). The company's website, http://www.geawineworks.com/, has additional information. Expect to see Centellino in stores that sell good wine accessories. Another alternative is a device called the Vinturi Wine Aerator, also sold in wine accessory stores. I saw one recently in a VQA store. This is a hand-held device that one holds above the wine glass while pouring the wine through it. The wine swirls through the device and this aeration opens the flavours and aromas. A third device is a Danish-made product called the Wine Finer (see the photo at the upper right), which is distributed in British Columbia by Nuance Finer Imports in Summerland (contact Mike or Debbie Bevan, 250-494-52070. Their website is www.wineaerator.ca and it lists retailers. The elegant Wine Finer slips into the wine bottle, doubling as a pour spout. The wine also swirls through it, picking up the air needed to soften and open the wine. The device also includes a filter that strains out sediments. I have experienced all three in action. Each one sells for around $50 (give or take $10) and each one delivers what it promises. Young red wines clearly taste better. Your choice will depend on how you feel about the aesthetics of each of these gadgets. A dozen wines emerged this year from 248 submitted for competition to win Awards of Excellence in the Lieutenant Governor's competition. This competition began in 2003. It is one of the few wine competitions with no entry fee. It is open to all wines produced from British Columbia grapes. The panel of judges (of which I am one) taste the wines blind. That is, we do not know who the producers are. We are supplied only with the variety and the vintage. It is a tough competition. The maximum number of awards of excellence has been 12; in some years, it can be less. There are no second places. This year's awards went to a broad range of producers, large and small. Some of the winning wines are remarkably affordable, proving that a top wine does not have come with a top price. Bounty Cellars 2007 Pinot Blanc ($16.90). Bounty is low-profile winery in an industrial park not far from the Kelowna airport. Most of its business involves making private label wines. Recently, as an example, it released four private label wines for the University of British Columbia's alumni association. However, the winery does sell through private wine stores (see the Bounty website for a list). CedarCreek Estate Winery 2006 Platinum Reserve Merlot ($40.10). Platinum Reserve is the top tier of CedarCreek's wines. That name was coined by Okanagan Wine Festival judges in the early 1990s who thought a CedarCreek Merlot was so good that they gave it the first and only platinum medal ever in that competition's history. I was a judge on that panel, too. If that was a good Merlot, this one is over the moon. My records are incomplete but memory tells me that CedarCreek has won previously. Church & State 2006 Syrah ($26). Church & State currently has its wine shop in Saanich but most of its wines are made in the Okanagan with Okanagan grapes. The winemaker is Bill Dyer, an all-star consultant from California who previously was Burrowing Owl's winemaker. He made great Syrah there as well. Howling Bluff Estate Winery 2006 Pinot Noir ($29.60). Howling Bluff is a new winery on Naramata Road, owned by former investment advisor Luke Smith. This will be a hard wine to find because only 140 cases were made and only nine are left at the winery. The good news is that Luke believes the 2007 Pinot Noir is even better than this winner. JoieFarm 2007 Reserve Chardonnay ($30). JoieFarm is also a previous winner in the LG competition. The wine will be released in September and 425 cases were made. JoieFarm 2008 Riesling ($27). JoieFarm made 1,000 cases of this wine. It should be more easily available in private wine stores. Peller Estates 2007 Private Reserve Pinot Noir ($18.99). This wine is great value and it is widely available - even in B.C. liquor stores. This award should draw attention to how much Peller wines have improved over the past several vintages. Road 13 Vineyards 2006 Fifth Element ($35.99). This red is an elegant blend of five grape varieties - four Bordeaux varieties and Syrah. This winery is also a repeat winner of this award. Sandhill Wines 2007 Small Lots Syrah ($34.99). This wine has just been released. Consumers need to move fast to get some of this excellent Syrah - only 224 cases were made. It can be ordered through the website. Sandhill is another repeat winner. See Ya Later Ranch 2008 Gewurztraminer ($17). It is only right that this wine wins an award. The See Ya Later vineyard is North America's largest single block of Gewurztraminer and obviously one of the best. The wine is available in VQA stores, among other places. This winery is a repeat winner. Stoneboat Vineyards 2007 Pinotage ($24.90). Stoneboat is a small new Oliver winery that won an LG last year with a Pinot Noir. Pinotage, a variety created in South Africa, is made by only a handful of Okanagan wineries. Wild Goose Vineyards 2008 Pinot Gris ($18.99). I have lost count of how many LG awards have been taken by this excellent winery at Okanagan Falls. It may be five by now. The best bet is to order directly from the winery. Congratulations to all - and to the producers of the other wines. There were a lot of fine wines entered this years. After several years of hand-selling its wines (primarily to restaurants), Blackwood Lane Vineyards & Winery is about to open its own wineshop in a remodelled house on a south Langley hilltop with views of Mount Baker. To borrow a phrase from the advertisements for Junker, a Langley car dealership, "it's worth the drive!" These are wines for the connoisseur - hopefully, the well-heeled connoisseur. Some of these tasty wines are not inexpensive. The Reference (above), for example, is an $89 Bordeaux blend. Alliance, another of the winery's Bordeaux blends, sells for $59. Are they worth it? Wait until you see the scores. Blackwood Lane's tasting room is at 25189 8th Avenue. It overlooks a south-facing slope with a two-acre vineyard. As it happens, the vineyard is being replanted after last's hard winter. However, while the winery has based itself in Langley, this is in every other respect an Okanagan winery, with grape purchase contracts throughout the south Okanagan including the storied Inkameep Vineyards near Oliver. Like Domaine de Chaberton and Township 7, Blackwood Lane prefers to have its winery close to the important Vancouver market. The winery is operated by Carlos Lee, a Vancouver businessman of Korean parentage who grew up in Peru, and Charles Herrold, a 1980s rock musician turned businessman turned winemaker. In most blind tastings, it is hard to single out the winemakers. That is probably not so with Blackwood Lane. 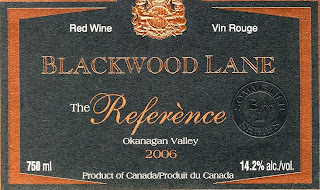 Charles stamps his wines with as identifiable a signature as any British Columbia winemaker. The wines, especially the reds, share bold, athletic builds - powerhouses of flavour. The reds have the structure to age but without the harsh tannins sometimes encountered in pricey reds. With a bit of decanting, these wines can be enjoyed now. With a bit of patience, they can be enjoyed five or 10 years from now. Aggressive pricing (not all Blackwood Lane wines are expensive) might be a risk in this economy. However, these are small lot wines. Only 240 cases of The Reference were made. Even in this economy, there are enough collectors, connoisseurs and plain old high rollers to soak up that modest number of cases. The prices reflect the high cost involved in making these wines. Charles and Carlos generally pay top dollar for Okanagan grapes in an effort to assure themselves of premium quality fruit. The reds are aged as long as two and a half years in expensive oak barrels, mostly French, and then age still further in bottle before being released. That is the formula for handcrafting expensive wines. I recently tasted through the range of wines that are expected to be available in the Blackwood Lane wine shop, come the grand opening promised on the web site. The partial bottles were retasted again over the following several days, to see how the wines evolve. They improved and remained delicious as long as - in the case of a Merlot - a week after the original bottle was opened. Such sturdy winemaking is commendable. An explanation on why two of the wines are called Vicuna, the name of a particular Peruvian llama. When Carlos and Charles bought this Langley farm, the neighbour had a herd of llamas. Sentimental for the country of his childhood, Carlos suggested naming some wines after those animals. No sooner had Blackwood Lane committed to those names than the neighbour sold the herd. Vicuna Blanco 2008 ($19). This is an appealing aromatic blend of (mostly) Pinot Gris, Riesling, Chenin Blanc and Gewurztraminer. The wine has clean, refreshing flavours of pears and citrus fruits, with a tangy finish. A very quaffable white. 88 points. Vicuna Roja 2005 ($N.A.) This is an unusual but successful blend of Pinot Noir (42%) with Merlot, Cabernet Franc and Cabernet Sauvignon. It is a juicy wine with flavours of lightly spicy strawberry jam. 88. 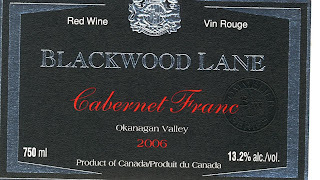 Blackwood Lake 2006 Cabernet Franc Sommelier Series ($44). The exceptionally grown fruit is from Inkameep and the wine spent 18 months in French oak. This is a vibrant red, with aromas of red currants and pencil lead; and with flavours of currants and cherries. The finish goes on and on. 90 The recently bottled 2007 Cabernet Franc is comparable. Blackwood Lane 2006 Merlot Sommelier Series ($39). Another bright, lively red with flavours of cherry, blackberry and currant with a touch of vanilla on the nose. With time in the opened bottle, the wine became richer on the palate without losing freshness. 90 The recently bottled 2007 Merlot is comparable. The newest winery in the Kelowna area, Camelot Vineyards, opened its tasting room last month and released its first two wines. This is a winery to watch because the winemaker is Kelowna-born Ann Sperling, a member of the power couple of Canadian winemaking. She and Peter Gamble, her husband, are winemakers for two exciting Ontario wineries and consultants for several other wineries in Canada and abroad. Currently, Ann is also making wine for Sperling Vineyards Winery, her family's new Kelowna winery. That winery's tasting room is not open yet but apparently Sperling Vineyards wines have been making their way into the market by way of another winery's license. Camelot is a venture owned and operated by two Air Canada flight attendants, Robert Young and his wife, Denise Brass. They took over his late father's orchard in 1996, converting the property to vines a decade later because apple growing had become uneconomic. Having been burned by the apple market, Robert and Denise decided that they would go beyond merely being grape growers by adding a winery. Last summer when they began looking for a winemaker - they are not winemakers themselves - Robert and Denise discovered that Ann was looking for a licensed winery in which to make the initial vintage for Sperling Vineyards. It was a marriage made in heaven. The Camelot winery is only a few kilometres from the Sperling property while Ann is a winemaker with 25 years of experience. She began her career in 1984 with Andres, moved to CedarCreek in 1991 and then to Ontario in 1995. There, both she and Peter have launched several top wineries. Currently, she is the winemaker for Southbrook's new Niagara winery. The plan is to establish a small winery for Sperling Vineyards in Pioneer Market on Benvoulin Road where Ann's mother has operated a popular market and bistro for many years. Fittingly, this is near the Father Pandosy Mission where the Okanagan's first small vineyard was planted about 1860. Ann's parents, Bert and Velma, now own a 45-acre vineyard in East Kelowna. 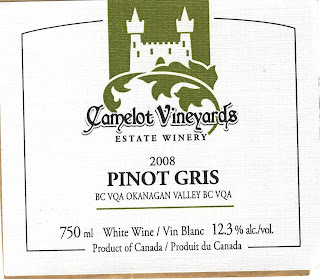 The two Camelot white wines reflect the cool 2008 vintage in the north Okanagan. Both are lean, with moderate alcohol levels and good acidity. The Pinot Gris ($22.39) displays aromas and flavours of citrus and pear and has a crisp tangy finish. This is a food wine, not a sipping wine. I make that distinction because Pinot Gris styles vary considerably among the many wineries making this varietal. 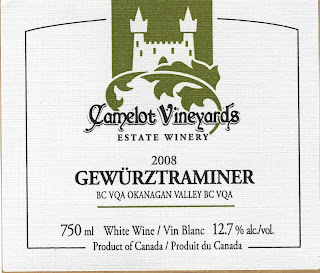 The Gewurztraminer ($25.70) is light and refreshing, with typical spicy aromas, mint candy and peach fruit flavours and with a dry finish. This is the one I would sip while preparing the fish to go with the Pinot Gris. Camelot has four more wines to release: a Chardonnay, a Merlot, a Cabernet Franc/Merlot and a Syrah. The winery takes its name from what Robert Young Sr. had called a home he once owned in West Vancouver before moving his family to the Okanagan. That inspired his son and daughter-in-law to build a Medieval-themed tasting room, complete with King Arthur's round table, swords, shields, jousting gloves and a six-foot suit of armour. The tasting room, located at 3489 East Kelowna Road in Kelowna, is open Thursday, Friday, weekends and statutory holidays from 11 a.m. to 4 p.m. (5 p.m. on the weekdays) until November 1; or by appointment. Last Saturday's Fraser Valley Winery Association (FVWA) festival - its second annual festival at Langley's Highpoint Equestrian Community- gave consumers a chance to taste products from wineries not nearly as well known as they should be. That would seem to be one of the reasons for the FVWA to exist: to spread the word about its members, just as the Naramata Bench Wineries Association has done so brilliantly. However, the event also disappointed because almost half of the Fraser Valley wineries were not even there. The reason has a lot to do with the distressing politics in the British Columbia wine industry. A 2007 brochure for this association lists 11 wineries, including Glenugie (which is scheduled to reopen in August under new owners and a new name) and Chilliwack's St. Urban Winery. The latter may or may not be open. It was absent from last year's tasting and, while there was a place card for the winery this year, it was again absent and no one could explain that. Also missing was Mt. Lehman Winery, which opened in Abbotsford on the same weekend that the association was having its festival. Mt. Lehman decided to skip the festival in favour of its own opening weekend, an understandable decision but perhaps not the shrewdest one. * Township 7 Vineyards and Vista d'Oro Farms and Winery, both of which have left the Fraser Valley Association. 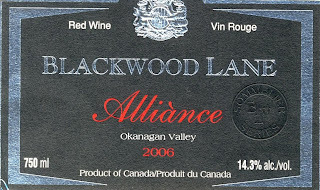 * Blackwood Lane Vineyards & Winery, just weeks away from opening its Langley area tasting room, has not joined FVWA. * Blue Heron Fruit Winery and Kermode Wild Berry Wines, both producers on the north side of the Fraser River. Blue Heron was formerly a member of the association. I can only speculate that these producers believe they are too small to be in the association at this time. * Lulu Island Winery, sister winery to Richmond's Blossom Winery, which is opening this weekend in Richmond. * Isabella Winery, a low profile Richmond commercial winery right on the banks of the river. * Constantin & Vasilica Wines, the fruit winery at the south end of Cultus Lake that formerly was known as Columbia Valley Classics. The current owners are in the wine business by accident, having bought the property for its farm, not for the winery. * Campbell's Gold Honey Farm. This is the Fraser Valley's only meadery, based at a lovely Abbotsford farm. The producer seldom has enough mead to go into tasting events. Township 7, under its previous owners, was an originating member of FVWA. It has dropped out as a consequence of a growing conflict between the valley's biggest winery, Domaine de Chaberton Estate Winery, and the British Columbia Wine Institute (BCWI). Domaine de Chaberton chose not to remain a member of BCWI after BCWI became a voluntary trade association but it continued to sell its VQA wines through VQA stores, among other channels. The VQA store licenses are controlled by BCWI. In February BCWI imposed a six percent surcharge on the sales of VQA wines by non-member wineries through the VQA stores. The logic is that the stores initially were intended to benefit BWCI members and to support the BCWI's promotion of all VQA wines. Wineries that decline to support the BCWI with membership fees should not have the same privileges as those that do. However, wineries like Domaine de Chaberton regard the surcharge as discriminatory. Domaine is leading a group of wineries, VQA and otherwise, that are lobbying the provincial government to lean on BCWI. If that does not succeed, I would not be surprised to see litigation. Township 7's current owner, Mike Raffan, sits on BCWI's board of directors. That put him in conflict with the Domaine de Chaberton group. He decided he could not participate in both BCWI and in FVWA at the same time because of this conflict. It appears that both Vista d'Oro and Blackwood Lane are not in the FVWA because they choose to sit out the dispute as well. These decisions, understandable as they are, certainly reduce the ability of the FVWA to promote effectively, if at all. Yet the wineries need this promotion. I would suggest that the majority of people in Metro Vancouver have no idea there are so many wineries in the valley. Indeed, it is ironic that FVWA should be weakened by argument among VQA wineries since most FVWA members are fruit wineries - and fruit wine is not even recognized by the VQA. Sanduz Estate Winery Merlot 2005. This Richmond winery has a long list of both fruit and grape wines, including a black currant wine so concentrated that it is almost overpowering. This Merlot, however, is a delicious middle-of-the-road red. River's Bend Flaxen 2008. I am not sure where the name came from but this is a crisp, lean white blended from Pinot Gris, Kerner and Gewurztraminer grapes grown on this winery's Surrey vineyard. River's Bend Black Horse 2006. This is an appealing and unusual blend of Syrah, Merlot and Cabernet Franc. Domaine de Chaberton Bacchus 2008. This spicy, aromatic white, a refreshing summer wine, is one of the flagship varietals here. Domaine de Chaberton Canoe Cove North Bluff Pink 2008. This is a juicy rose, full of the flavours of strawberry and rhubarb; another fine summer quaffer. Wellbrook Winery Blueberry. This is a full-bodied wine with tons of fruit flavour and with a nice dry finish. Wellbrook is in Delta, just off the highway to the U.S., and easy to visit. The Fort Winery Keremeos Pear Apple 2007. Crisp and refreshing, this is a tangy cider-style beverage with a good dry finish. Ted Bowman, the winery's community relations coordinator, has a good argument for drinking fruit wines as well as grape wines. "Drinking fruit wine is like having a colour TV," he says. "Why settle for just black and white?" Pacific Breeze Winery Vin de Garagiste 2006. This fine boutique winery operates from an industrial strip in New Westminister. The winery really does look like a garage - but all the wines, made with premium Washington and California grapes, are first rate. I hope FVWA thrives and continues to do more such events.